The touching prequel to the bestselling novel A Dog Named Christmas The sleeper hit of 2008, A Dog Named Christmas became a Hallmark Hall of Fame movie a year later, seen by more than twelve million people in the United States alone. Now, in Christmas with Tucker, Greg Kincaid brings back one of that book’s most endearing characters, sharing the moving story of George, a young boy dealing with the loss of his father, and the dog that comes into his life to offer him hope and a touch of courage. It is the winter of 1962, and Kansas is hit with one of the worst blizzards in its history. It is during this cruel season that twelve-year-old George is called upon to endure more than even most grown men could withstand—the death of his father and the upkeep of the family farm that is his legacy. When his mother and sisters leave for Minnesota, George has only his grandparents and the companionship of Tucker, an Irish setter, to help him persevere through these most difficult challenges. Can he find the strength to walk the road that leads to healing, finding his true self and ultimately becoming a man? 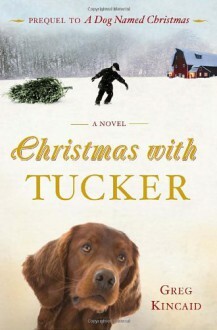 A coming-of-age story for readers of all ages, Christmas with Tucker is a classic Christmas story about a young man’s love for his dog, his family, and his farm. This has become one of my favorite holiday books. The story of the McCray family and their problems is set in Kansas in 1962. A family that knows what is important in life.